Midgley United v Shelf FC.' Joe Gibson for Midgley and Callum Lewis for Shelf. It wasn’t as easy as the score line suggests with Calder working hard throughout and three of the home side’s goals coming in the last 15 minutes. Shelf bossed possession and hit the post twice in the first half through Brad Wilkinson and David Chappell, Ben Grech putting away the rebound from one of them to open the scoring approaching the half-hour mark. Calder won a couple of free-kicks in dangerous positions and although they didn’t give Shelf many anxious moments, it was a relief for the home side when Matty Roy cut in the right and hit a left-foot shot into the top corner. Grech converted a penalty after being brought down from behind and Chappell crossed for Oliver Coates to complete the scoring. Success moved United to within four points of leaders Sowerby Bridge, who have completed their fixtures. United travel to Luddenden Foot for the return game next Saturday and will have two more opportunities to get the six points they need at home to Hebden Royd Red Star and Shelf FC. Shelf FC, who are third, maintained their pursuit with a 6-1 win at Midgley United with a hat-trick from Alex O’Keefe, two from Callum Lewis and one from Andy Hawker. It completed a disappointing second half to the season for Midgley, who were clear leaders at one stage but have come unstuck in more difficult fixtures since and faded to sixth. They started well on Saturday and went 1-0 up through Kurtis Elder. Boss Craig Gee felt they were the better team for 30 minutes but Rob Stansfield, who had caused the visitors problems, suffered a broken nose and the home challenge faded. Shelf FC scored twice before half-time and then pulled clear for a comfortable win. 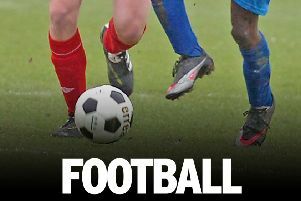 Sowerby United ended their season with a 9-5 win away to Ryburn United on Friday. Corey Henderson gave them an early lead before Nathan Hargreaves hauled Ryburn level. A superb run and cross from Jake Allott ended with James Crossfield scoring with a diving header. Hargreaves again made it all square, capitalising on a defensive error. Crossfield got his second before a Jake Tait free-kick beat Sowerby keeper Dan Crosland to make it 3-3. Henderson was outstanding and he added three second half goals to his tally along with three from Rory Thickett. Ben Horner and Adam Powell added two more for Ryburn to complete the goal fest. Flying Dutchman beat Shelf FC Reserves 3-1 at Westwood Park to draw level with their hosts on 32 points in the race of the runners-up berth in Division Three. Josh Martin, David Oakes and replacement Matthew Seekins scored for Dutchman, who have won their last six league matches. However, they have only a trip to runaway champions Elland United to come while Shelf FC Reserves have three home games left. Greetland look the team to beat in the new Eastwood Cup competition after an 8-`1 win over Illingworth SM on Friday. Shelf United Reserves won 5-3 away to St Columbas the following day.